According to the Hollywood Reporter, in the 18-49 demographic, THE age group advertisers crave like a vampire lusts after blood, Duck Dynasty is second only to The Walking Dead on all of cable and tops all broadcast offerings in its Wednesday time slot. Think about that folks, only The Walking Dead gets more cable viewers between the ages of 18 and 49. Let me put that another way, when the 2nd season finale of Duck Dynasty aired in December 2012, the West Monroe Louisiana based reality TV show BEAT CBS’ Survivor, ABC’s Nashville and Fox’s The X-Factor, while matching CBS’ Criminal Minds. 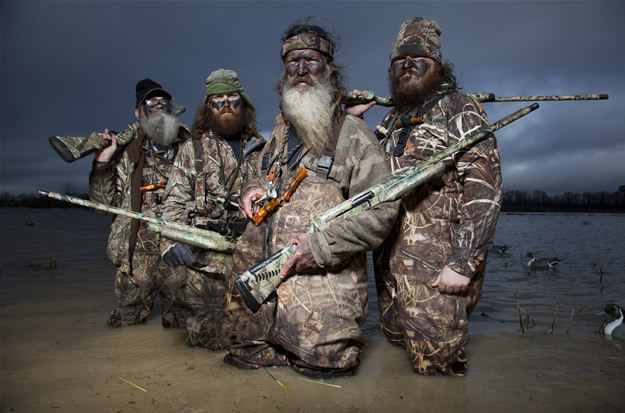 This was the finale of a season that saw Duck Dynasty’s audience share grow 139%! Now, some folks are faulting the DD gang for wanting more money. Why, they signed a contract! Those scraggly, shaggy, greedy, too-big-for-their-britches, rich old rednecks ought-ta honor it. Well, maybe – but that ignores the ‘reality’ of reality TV, unknown ‘stars’ sign contracts but if the show becomes a hit, in almost every case, think Jersey Shore, Real Housewives, etc – the now very-well-known stars claim their original contracts aren’t fairly reflecting the advertising $ they are bringing in and demand a higher salary. The stars of the show win almost every time. They wanna bigger piece of the pie. And when the pie is one of the biggest shows on television, you can bet the cooks will want a bigger share when American’s Nielsen family wants a slice. When I hear the arguments against monster paychecks for TV stars or professional athletes I wonder, do the people complaining about these exorbitant salaries realize these people are employees, working for a paycheck just like most of them? They have a boss and that boss writes them a check for their services. People will get so fired up, so upset, so high and mighty about the paycheck someone receives yet the fact that a MUCH RICHER person is quite willing and able to write that outrageous paycheck, well that never seems to bother them at all. The Beards have earned it, so cough up the dough A&E. Now I’d like to talk directly to my home folks, my friends, neighbors and extended family here in northeast Louisiana. Please stop being so dang hateful, or as the kids say, hating on the Robertson’s and Duck Dynasty. All those terrible stories happened in the last year and attracted worldwide attention, putting the spotlight on northeast Louisiana in a very negative manner. And now, we have a TV show based right here in our own backyard, one that has given us some great news coverage, brought positive attention to our home, yet my Facebook news feed is filled with anger and bitterness, in some cases pure vitriol that goes beyond jealousy, it truly defies me. And why? Because they’re rednecks?!? Oh, please. If you’re a northeast Louisiana native and can watch a few episodes of Duck Dynasty without seeing someone from your own family, then you’re very unusual. Or else you’re lying. Oh, it’s because they pretend to be rednecks, they’re millionaires, how dare they act like one of us just so people can’t point and laugh at how ‘hickish’ we are here! This is us folks, the reason we call ’em stereotypes is because they’re true. Yankees are usually rude, west coasters are usually weird, people who live in the south are usually rednecks. I’d never tell anyone how to think. If you don’t like Duck Dynasty that’s cool. And certainly you are most welcome to express that opinion. Don’t take it personally when I say you’re cutting off your nose to spite your face. The fame of the show translates to much needed, big-time $ infusions into the local economy and that helps you and me. The collective community pride, the bragging rights afforded northeast Louisiana from having a mega-hit TV show based here, in a region sorely in need of reasons to feel good about itself, is worth much more. The story of a Louisiana Tech football player who started a business in his West Monroe backyard that grew into an international corporation, a business that celebrates and promotes the outdoor lifestyle so celebrated here in the ‘Sportsman’s Paradise’, is worthy as well. In fact, I think the Robertsons and Duck Dynasty are something all of us here in the northeast Louisiana should take great pride in. Even if Downton Abbey or Masterpiece Theater is more your speed. ← Can a Predator Become a Victim? They have earned the $200k per episode, but besides that, the bigger they get, the more folks they have to hire to help them with their business and various other ventures. I don’t see the $200k as selfish at all. They’ll do more good with that money than most of the other trashy reality TV stars, I promise. Amen brother! I live in Lake Charles and I know folks like them and it is so much fun to lampoon ourselves!! I worked for the state about 35 years, and I always wanted a raise, but couldn’t because of state restrictions. In their case, if they signed a contract they should be satisfied with their pay. 200K per episode is more than most people make in 3-4 years.